Above: The Hourglass Cosmetics Ambient Bronzer in Luminous Bronze Light, resplendent in the sunshine. 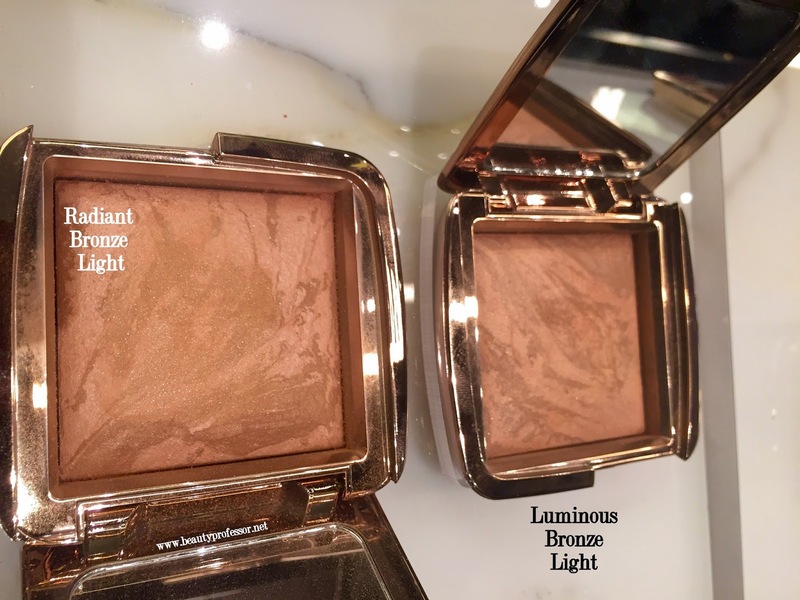 The *Hourglass Cosmetics Ambient Bronzers have arrived! Currently available online at Sephora for VIB Rouge and VIB members and available for all on 4/15 at Sephora and Hourglass, this marbleized formula imparts the most gorgeous glow. 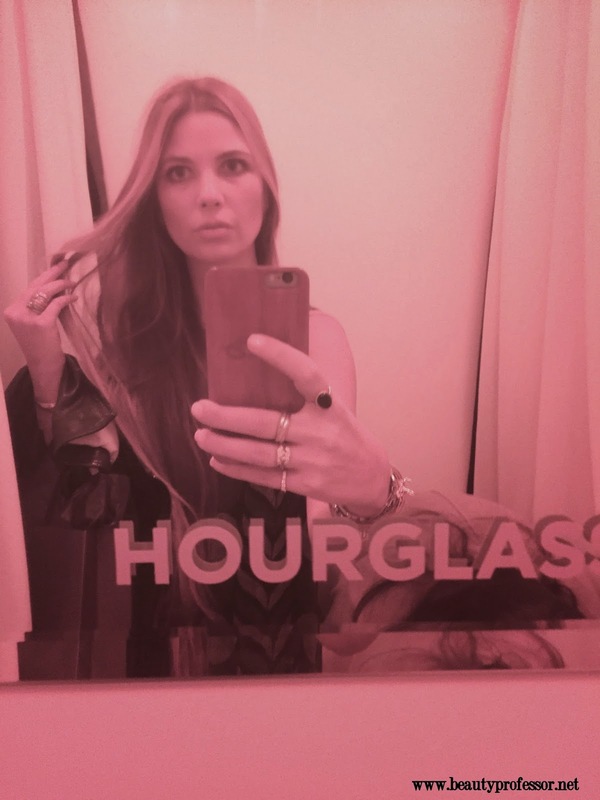 I was able to preview the bronzers during their debut at the Hourglass Flagship Store on Abbot Kinney in Venice Beach last week and, since having one in my possession, have worn it daily since then! Above: The Hourglass Ambient Bronzers in Radiant Bronze Light and Luminous Bronze Light. Above: The Hourglass Flagship Store on Abbot Kinney in Venice Beach, CA. Above: Both bronzers side by side in the flagship store...Radiant Bronze Light is a bit warmer than the neutral Luminous Bronze Light. 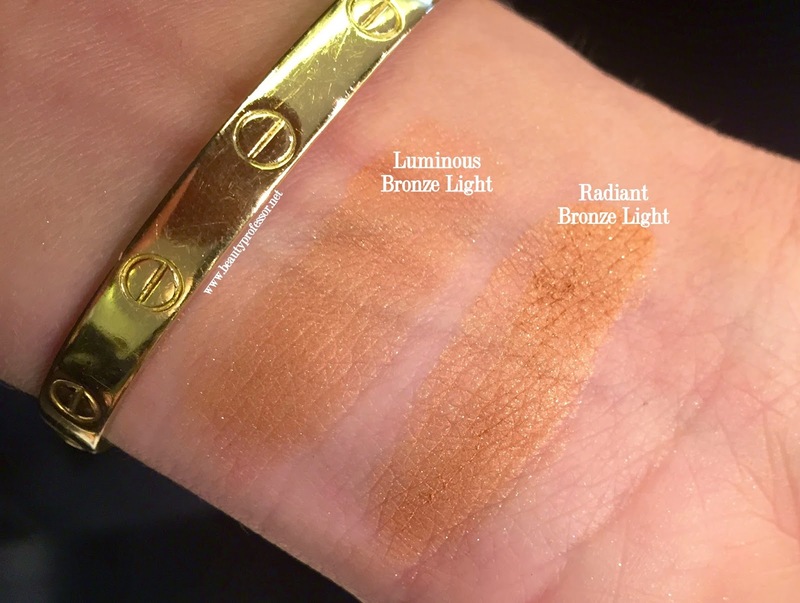 Above: Swatches of both bronzers in indoor lighting. As aforementioned, Radiant Bronze Light leans slightly warmer/more gold than the more neutral Luminous Bronze Light. Either shade will work well with a spectrum of skin tones. Above: In the customized "ambient lighting booth" which cast the rosy bronze glow of Luminous Bronze Light. Above: From the upper level...the clean lines and modern aesthetic of the flagship store are stunning, no? Above: The illustrious array of Hourglass base products including the Immaculate Liquid Powder Foundation (reviewed HERE and available at Sephora, Net-a-Porter, Space NK and Barney's NY). Above: In front of the Ambient Lighting booth. Above: With Hourglass Director of PR and Consumer Engagement Mary Friberg. Above: Hourglass Director of Product Development Charlene Valledor, BP, Director of Opererations Erin Hovi and Project Director Jenn Janes. Above: With Hourglass Cosmetics CEO Carisa Janes. Above: An extreme closeup of the Ambient Bronzer in Luminous Bronze Glow...the tender beige and tan marbling is mesmorizing. On to the bronzer itself! This finely milled powder comes in the now-iconic metallic rose brown compact associated with the Hourglass line and is the same size as the original Ambient Lighting Powders (reviewed HERE). I must confess, for me this bronzer was love at first swatch! In a word, this bronzer is transcendent! Above: Luminous Bronze light in direct sunlight. Ambient Bronzer’s sheer, airy formula sweeps softly onto skin for a healthy-looking, radiant finish. It’s formulated with Photoluminescent Technology, featuring optically transparent particles that transform the look of skin by manipulating and refracting light to emphasize your best features. The optically transparent particles allow for seamless blending and color transitions. The powders, blended by hand using an advanced miscelare technique, offer the perfect balance of pigments in a gorgeous pattern. Use this bronzer alone, or paired with Ambient Lighting Powder for maximum control to create depth and dimension—or even use it for a subtle contouring effect. Mica, Synthetic Fluorphlogopite, Boron Nitride, Hdi/Trimethylol Hexyllactone Crosspolymer, Polymethyl Methacrylate, Octyldodecanol; Benzoic Acid, C13-14 Isoparaffin, Dehydroacetic Acid, Diamond Powder, Dimethicone, Ethylhexylglycerin, Laureth-7, Magnesium Aluminum Silicate, Phenoxyethanol, Polyacrylamide, Polymethylsilsesquioxane, Potassium Sorbate, Silica, Sodium Dehydroacetate, Sorbic Acid, Sorbitan Sesquioleate, Tin Oxide, Trimethylsiloxysilicate, May Contain (+/-): Red 7 Lake (Ci 15850), Bismuth Oxychloride (Ci 77163), Iron Oxides (Ci 77491, Ci 77492, Ci 77499), Titanium Dioxide (Ci 77891). Above: A perfect pair...Ambient Bronzer + *Ambient Lighting Powder Brush. Above: The beauty that is the Hourglass Ambient Powder Brush...dense and fluffy, this brush adeptly applies the perfect amount of powder for contouring, shading and bronzing. Above: A single swatch of Luminous Bronze Light in direct sunlight. Above: Bronzers suitable for comparison swatches. Above: Bronzer comparison swatches in outdoor shade. 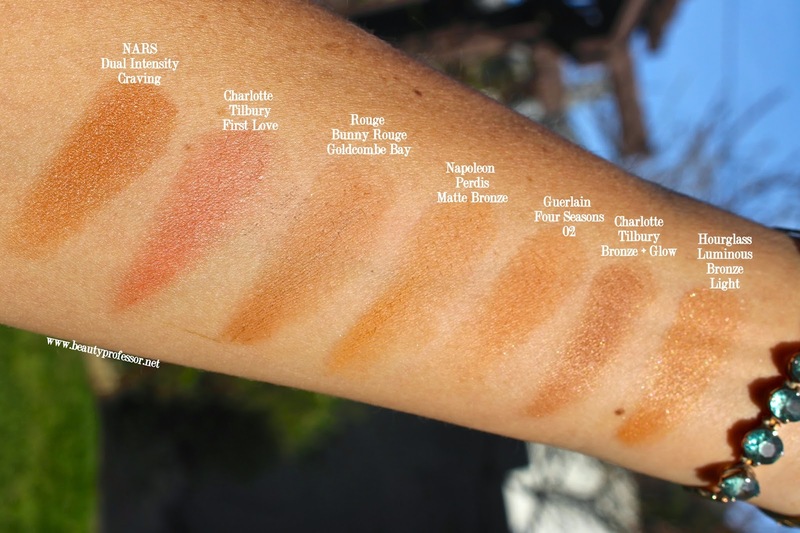 Above: Bronzer comparison swatches in direct sunlight. Above: The diversity of packaging never gets old. Above: Hourglass simplicity...Luminous Bronze Light, Extreme Sheen Lipgloss in Child and 1.5 MM Mechanical Gel Eyeliner. Above: Swatches of Hourglass in harmony in direct sunlight. Hourglass Ambient Bronzer in Lumious Bronze Light applied as a contour/bronzer...nothing else used on my cheeks! Bottom Line: Ever since getting chance to try the Hourglass Ambient Bronzer, I have been using it nonstop; the finely milled texture melds with my skin effortlessly and wears beautifully for hours on end. I am confident that this will continue to be a fixture in my makeup bag as the weather continues to warm up...the Ambient Bronzer glow is utterly addicting! Have YOU yet tried the Hourglass Ambient Bronzer? If not, I implore you to consider doing so! Good things ahead, including foundation reviews, new product procurements, a skincare update and a fresh FOTD. I am also in the midst (as always) of responding to your lovely emails and comments! Thanks, Lena...I love this bronzer! Your skin looks perfect with this make up! You look luminous and fresh! So glad you are loving the PV...it is so good. You absolutely need this...hope your week had been going well! The Luminous is slightly lighter and more neutral than the Radiant and I prefer to start a bit lighter as everything tends to go dark on my skin over time. Luminous is perfect for my skintone!